Holy Cross Medical Center is the central hub for health care in north-central New Mexico. Our hospital and clinics are home to over 80 physicians, covering a variety of ever-expanding specialties that include internal medicine, wound care, dermatology, ob/gyn, orthopedics, general surgery, urology and a fully-staffed emergency department. In an effort to help our community understand the changes happening in health care and at the hospital, we will be posting regular updates from the administration at Holy Cross Medical Center to help share information with the public. The second vacancy should be a Northern Taos County representative. 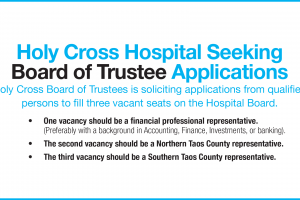 The third vacancy should be a Southern Taos County representative. 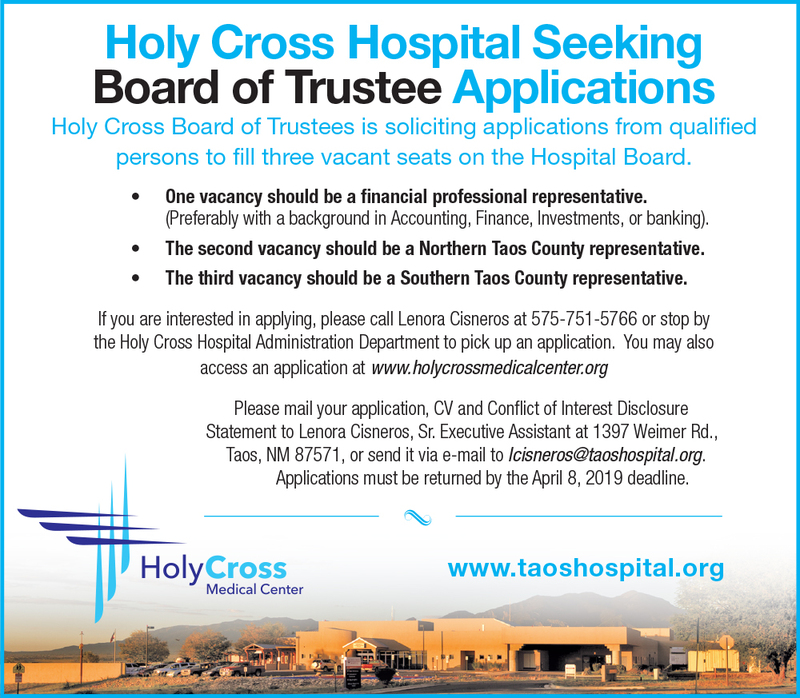 If you are interested in applying, please call Lenora Cisneros at 575-751-5766 or stop by the Holy Cross Hospital Administration Department to pick up an application. 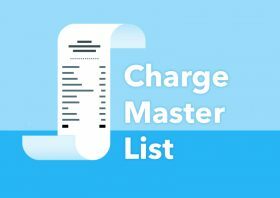 You may also access the application below. Or send it via email to lcisneros@taoshospital.org. Applications must be returned by the April 8, 2019 deadline. 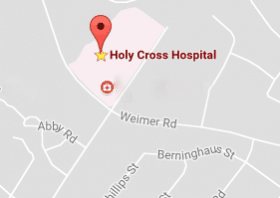 The purpose of this request for proposal is to review, select and implement a solution to replace the current Pathology model at Holy Cross Hospital. We are seeking an anatomical pathology and histology system that is patient-focused, provides a robust QC segment for anatomical pathology correlation and workload monitoring, and provides a fully focused application for the intensive interactive nature of the pathology workflow. Holy Cross Hospital is committed to continuously improving the care and services we provide in order to give you healthcare with peace of mind. We’re taking a big step forward and upgrading the tools our physicians, nurses and clinical staff use to take care of you. Holy Cross is taking our current electronic medical record system (EMR) to the next level by implementing new software systems in many of our clinic and hospital locations, software which has been specifically designed for small hospitals. The system is called CPSI – Evident and the Emergency Department will be using a system called Wellsoft. 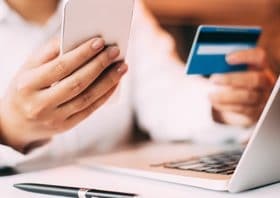 Most Holy Cross systems will go live on October 1st and the rest of the systems plan to be live by the end of the year. Your visit will likely take longer: We are doing everything possible to make sure our physicians, nurses, and staff have the time they need to get accustomed to using Evident. This means during our go-live period we are allowing more time for each patient appointment, so your visit may last a little bit longer than usual. We have scheduled Evident support personnel to be readily available to answer questions and provide direction during the first two weeks following our go-live event. You may want to choose an appointment later in October or early in November: This will help give our physicians, nurses and clinical staff the extra time they need to become familiar with the new system. You will have new Patient Portal options on our websites: Our websites will be updated as each location goes live with Evident. You can use the new web-based tools to communicate with your physicians via a Patient Portal. One of the very public benefits of the new Evident system is the enhanced Patient Portal. This portal will provide easy access to your health records and more information about your care. 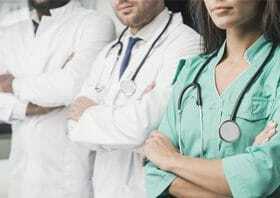 I encourage you to visit www.taoshospital.org to find out more about these benefits. Thank you in advance for your patience as Holy Cross takes this big step in improving the tools our physicians, nurses and clinical staff use to care for you!